If your prescription is older than two years, you’ll need to book an eye test with an optician. Read our Seeing Clearly Guide for further information. If you don’t have a copy of your prescription, ask the optician who carried out your test. Did you know they are legally obligated to give you a copy after your eye test at no extra charge? Browse our collection of designer and own-brand glasses. Our Virtual Try-On will help you find the perfect pair. Or why not try our free Home Trial service that lets you try up to four frames in the comfort of your home. Once you’ve chosen your frames, it’s time to pick your lenses. Start by selecting how you’ll be using them eg reading. 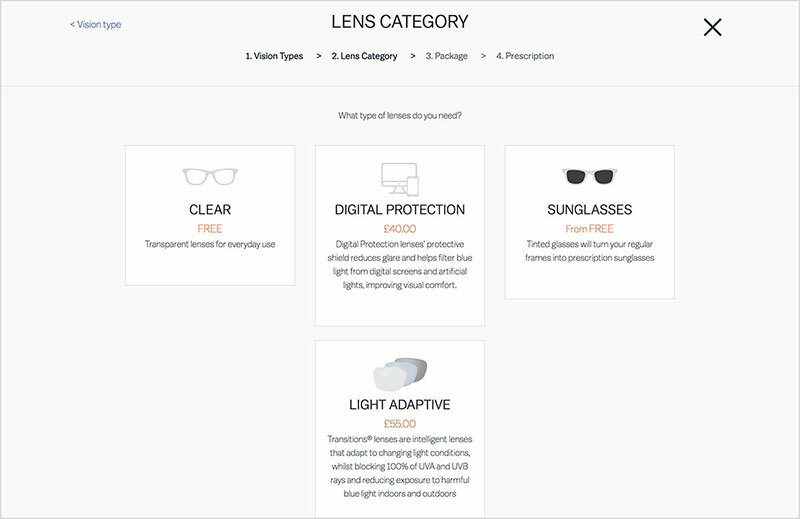 Next choose the type of lens you need eg digital protection. 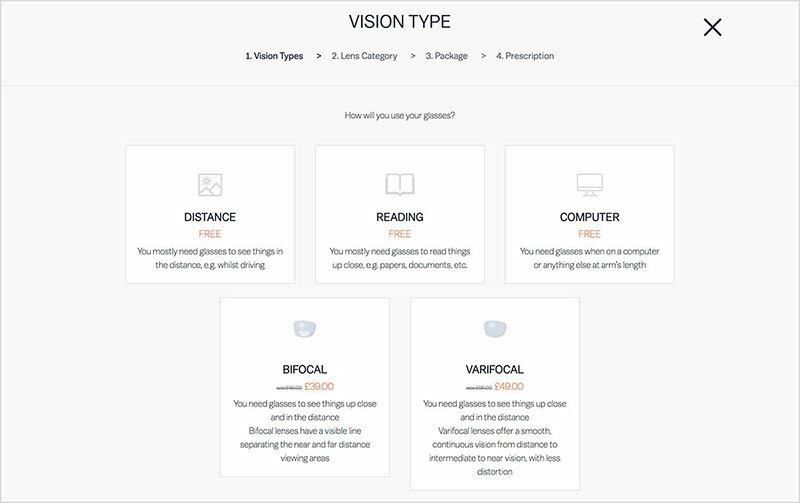 Here is where you can pick light adaptive lenses and dark tints to turn your frames into prescription sunglasses. 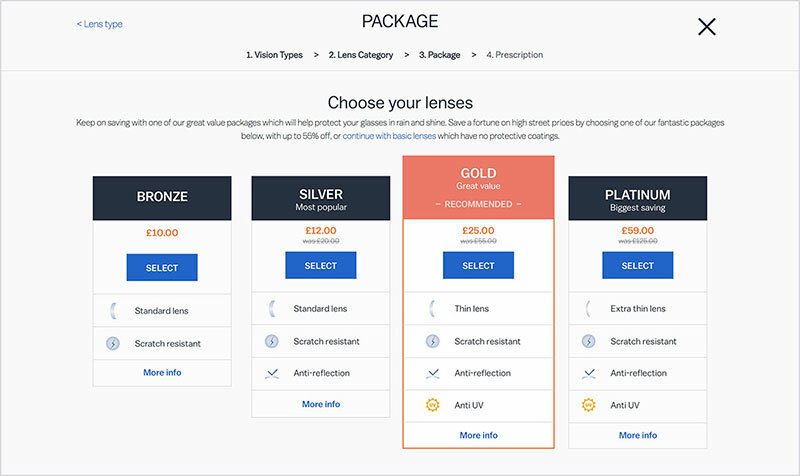 Then select one of our great value lens packages: Bronze, Silver, Gold or Platinum. If you don’t want to upgrade your lenses, simply click ‘continue with basic lenses’. Now you enter your prescription. For help, see ‘Understanding Your Prescription’, or if you have any questions, our qualified opticians are on hand to help. If you don’t have your prescription you can choose to send it later via photo, email phone or post by selecting ‘Send Prescription Later’. Take advantage of our FREE SECOND PAIR offer by selecting a second frame and completing the above steps before you check-out. Check your order to make sure you haven’t left anything out – double check you’ve added the free second pair. Once you’re happy with everything, select ‘SECURE CHECKOUT’. We accept credit/debit cards, PayPal and Accor/EdenRed Eyecare vouchers. Please contact our customer service team for details on how to pay with these vouchers.